There are very few true auteur’s left in the Hollywood system. A true auteur’s creativity shines through studio and producers interference in the film making process. Early in his career, Paul Thomas Anderson’s (PTA) voice shined through what I can only assume was some level of studio interference. Nowadays, PTA is on a different level altogether. Anderson has a level of free reign, where he can pretty much do whatever he wants, as long as a producer like Meagan Ellison will cut him a check. He makes films that feel HUGE on a modest budget, usually around $20-40 million. They say (I guess the experts) this type of film making is a dying trend. Studios today either want the $5 million cheaply made horror film or the $200 million blockbuster. There’s no room for mid-range directors like this to work in the system. Luckily for movie fans, this isn’t entirely true (at least not yet). Paul Thomas Anderson has delivered something unique once again with Inherent Vice and shows why he’s the best in the game continuing to evolve and grow as a filmmaker. Inherent Vice is a film only Anderson could make. He has a knack for the visual flair (Boogie Nights, There Will Be Blood), but also manages to make humorous films with heart. Inherent Vice is more along the lines of his 2002 comedy Punch Drunk Love, where the film is still spectacularly shot, but it’s done in a more subtle way. Inherent Vice has no huge set-pieces or intricate dolly shots, but still shows Anderson’s continual stylistic growth. Most of the shots in Inherent Vice are indoor conversations, so the limitations on what he could do are obvious. At the same time, exterior shots and dry witty humor are distinctly PTA, giving the film its own voice. This pot-filled trip film isn’t shot in the normal way directors tend to show how being on drugs feels, instead PTA messes with the viewers heads, making us feel like we’re in Doc’s (Joaquin Phoenix) shoes. Viewers aren’t sure what is real and what’s in Doc’s head as the movie progressively gets more and more surreal to the point where we must question reality. The story, adapted from Thomas Pynchon’s novel of the same name, Inherent Vice re-teams Anderson and Phoenix for the second time. Joaquin Phoenix plays Larry “Doc” Sportello, a private investigator who enjoys his marijuana and other substances in 1970’s Los Angeles. Doc is confronted by his ex-girlfriend who’s current boyfriend has disappeared. Doc falls down the psychedelic rabbit-hole, and the viewers are along for the ride. In the beginning things seem fairly straight forward, but things get weirder as Doc’s investigation dives deeper into the confusion of a drug-filled world split into hippies and those who hate hippies. Inherent Vice is set up as a detective story, sort of a new-age noire. This however is not how the film plays out and those who are seeking a straightforward film with a conclusive ending will be disappointed. It’s intentionally hard to follow, which will isolate most mainstream or casual viewers. Honestly, I need to watch it again in order to fully wrap my head around what I experienced. It’s a movie that will invoke conversations and leave you talking about the movie as you and your friends walk out of the theater. It’s a strange ride. Te humor is dry but easy to find. PTA also shows us once again that like a Woody Allen, he can pretty much get any actor he wants, and thought Inherent Vice characters minor to major give inspiring performances that leave an impact on your viewing experience. Joaquin Phoenix shows that he is one of, if not, the finest actors working today. Phoenix primarily carries the movie on his shoulders, as we see the action unfolding through Doc’s hazy perspective. It’s great to see the likes of Owen Wilson, Katherine Waterson, Reese Witherspoon, Benicio del Toro, Jena Malone, Maya Rudolph, and Martin Short pop up throughout the picture, but the other vital piece to the smoke-filled puzzle is Josh Brolin’s Det. Christian “Bigfoot” Bjornsen. Bigfoot is the perfect counter to the pot-loving Doc, as Bigfoot is the stern anti-hippie detective working both with and against Doc. Brolin provides some of the more memorable comic scenes, and other than Phoenix, steals scenes. Phoenix and Brolin work well off each other resulting in an incredibly funny film. Even as I write this review, I’m not exactly sure on some plot details. My memory of the film is hazy and somewhat confused. For this reason exactly it works. I think it was the point of the movie to confuse, or at least make the audience question the reality of certain situations. This was brilliantly done by Anderson, again without the trippy visuals directors resort to in order to show psychedelic experiences. Inherent Vice is a film that will make people talk and seek a second viewing to better understand what they just witnessed. If you’re thinking about seeing this movie but are hesitant, just go. Support the mid-range budgeted film so we get more. I love blockbusters as much as the next person, but these personal auteur level films is what keeps my interest in Hollywood. The academy undoubtedly will shun Anderson’s new film, as they always do, but go see it for yourself. My only advice going into the film is to be as clear headed as possible. Don’t take any of your personal nonsense into your screening of Inherent Vice, as you will certainly be confused regardless. It is this reason that I love this movie. I can honestly say I’veneer seen anything like this, although his influences are hazily visible. Paul Thomas Anderson is the master who shouldn’t be taken for granted. Each film in his filmography offers viewers something slightly different, yet maintain his voice no matter what the subject matter is. This is the true sign of an auteur who’s work will be remembered for years to come. 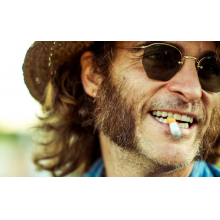 Inherent Vice is written and directed by Paul Thomas Anderson is now playing in limited theaters and stars Joaquin Phoenix, Josh Brolin, Owen Wilson, Katherine Waterson, Reese Witherspoon, Benicio del Toro, Jena Malone, Maya Rudolph, and Martin Short.